Absent from the Team World Cup in London when injury prevented participation, back in action in Qatar when he upset the seeding by beating Frenchman Simon Gauzy prior to losing to China’s Zhou Yu; Sweden’s Mattias Karlsson continued his quite outstanding run of success at the Seamaster 2018 ITTF World Tour Platinum Germany Open in Bremen on Saturday 24th March. Required to compete in the three day qualification tournament, after ousting Brazil’s Hugo Calderano, the no.13 seed, in the opening round (13-11, 9-11, 11-8, 10-12, 11-6, 12-10), he recorded an even bigger upset in round two to advance beyond the stage he had reached two weeks earlier in Doha. He beat Japan’s talented Koki Niwa, the no.4 seed; furthermore he secured victory in a most impressive manner; he won in five games (11-8, 8-11, 11-3, 11-8, 11-9). Success for Mattias Karlsson against the odds, in the remaining three matches in the second round of the Men’s Singles event in the lower half of the draw, it was success for the higher rated player. The host nation’s Timo Boll, the no.2 seed, emerged successful in seven games against Chinese Taipei’s Chuang Chih-Yuan, the 10 seed (11-3, 9-11, 11-13, 11-6, 9-11, 13-11, 11-7). A hard fought win for Timo Boll, life was somewhat less exacting for Hong Kong’s Wong Chun Ting, the no.6 seed. He ended Korean hopes by beating Lee Sangsu, the no.12 seed (11-7, 10-12, 11-4, 11-1, 11-6). 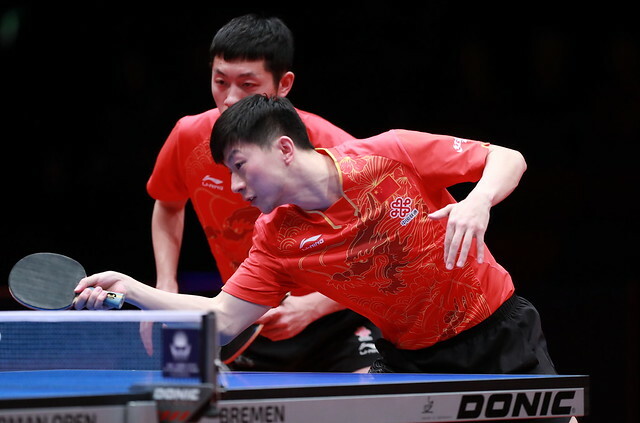 Impressive performances but arguably the most impressive was China’s Ma Long, the no.5 seed, ended the hopes of Japan’s Jun Mizutani, the no.11 seed (11-6, 11-7, 11-9, 11-9). At the semi-final stage Mattias Karlsson meets Wong Chun Ting, Tomo Boll confronts Ma Long. All Men’s Singles quarter-final matches are scheduled for later in the evening.